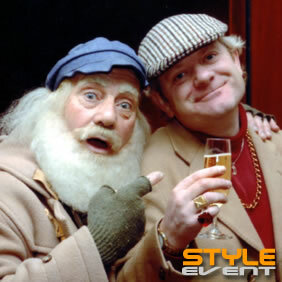 STYLE EVENT are proud to present Del Boy and Uncle Albert, The Trotters and their trusty companion the yellow three wheeler. They both decided the only way forward was to stay as faithful to the original characters as possible, which is exactly what they do! Whether appearing at a promotional event, a wedding, or store opening you can be sure that Del will have a suitcase full of dodgy gear, genuine fake Rolex®, and ‘those’ blow-up dolls! Wait till you see the dynamic duo with their twist on the hilarious Batman and Robin sketch, the blow-up dolls don’t stay deflated for very long. An outstanding double act that captures comedy gold at it's best.